Umed MSRLM Maharashtra State Rural Livelihood Mission has published an official notification for recruitment of 05 Mid Level Consultant Non Farm, Mid Level Consultant Organic Farming, Consultant, Senior Consultant Posts. Interested and Eligible candidates who wants to apply for these posts submit their applications by Email on given below given link before 16-0102019. For more details like age limit, salary, how to apply, selection process please refer the below article. The maximum age limit 35 years. 1. Mid Level Consultant Non Farm:- PG degree or PG diploma completed in agriculture and allied sciences or Business Administration or Social Work or Development Studies or Economics or Sociology or Anthropology or Engineering or Rural Development or Rural Management or Entrepreneurship Development or agribusiness management. Applications will be accepted as per the format attached to the advertisement only. 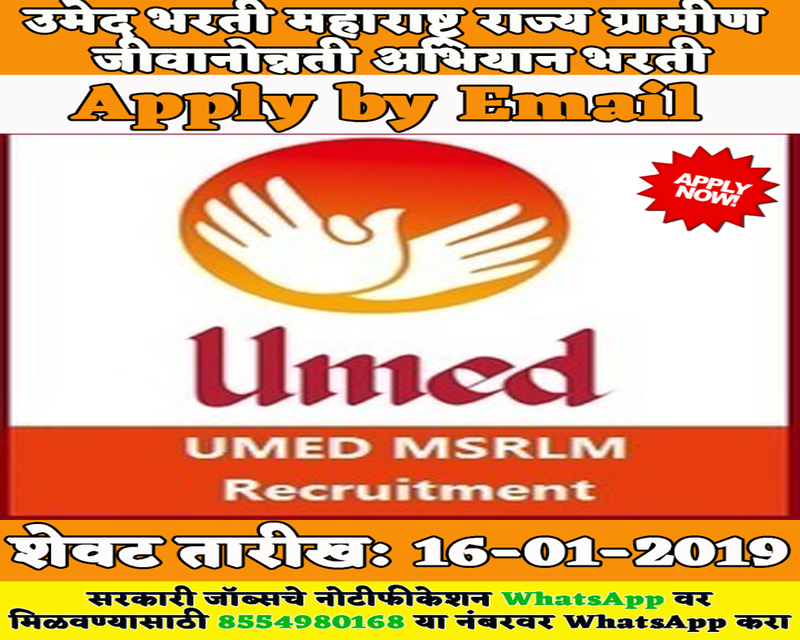 Scan copy of application should be send on consultantmsrlm@umed.in only on or before 16/01/2019 up to 11.59 PM. Written and oral examination can be organized as per the requirement for selection on this employment post. Please check the advertising PDF for more information on below given link.